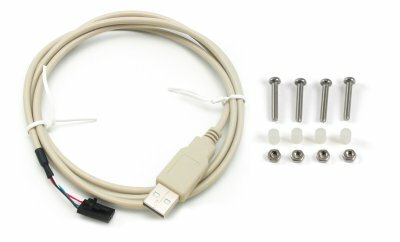 Now that you have everything together, let's start using the 1016! 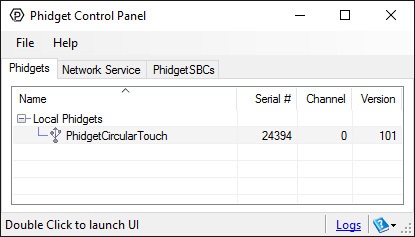 In order to demonstrate the functionality of the 1016, the Phidget Control Panel running on a Windows machine will be used. Linux users can follow the getting started with Linux guide and continue reading here for more information about the 1016. The sensitivity of the 1016 can also be adjusted. 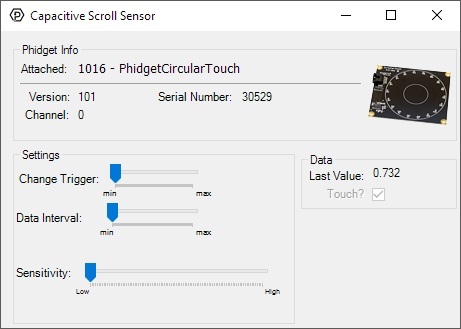 The higher the sensitivity, the more susceptible the 1016 will be to sensing touch. When the 1016 senses a touch, the state of the Touch? checkbox will change. The Last Value label corresponds to the location of the last touch along the 1016. The 1016 appears to the Phidget libraries as a CapacitiveTouch object. 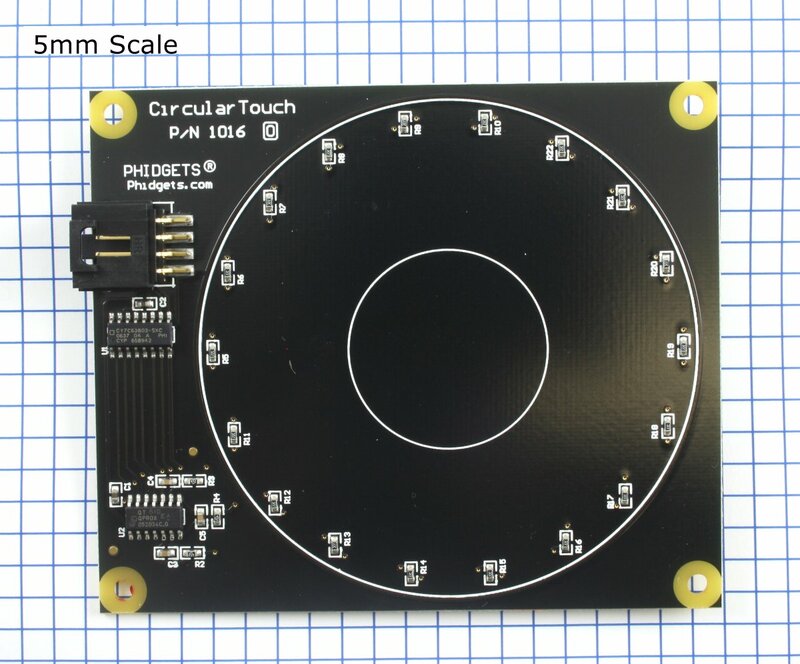 Sliding a finger around the touch sensor varies the axis value from 0 to 1 in approximately 125 discrete steps. When the finger is removed, the final measured value is retained. 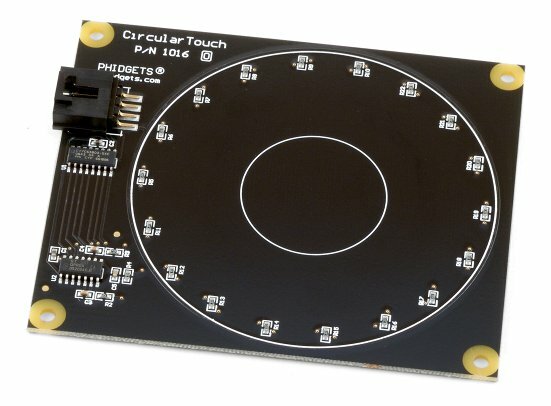 If it is desired to use the touch slider as an array of buttons, or a combination of an array of buttons and a smaller slide-touch area, one must only interpret specific sub-ranges of sensor values differently in software depending upon the intended use. If sub-ranges of values are to be used as buttons, it is recommended that a small range of sensor values be left between the sub-ranges where a null-response is observed. The 1016 has been left without components on the contact side so that it may be mounted behind a sheet of glass or plastic. The recommended thickness of separation material is 1/8". Silicon adhesive is recommended when attaching the Phidget to the material; standing the 1016 off or creating space between the separation material and the Phidget can cause false-triggering to occur. It should be noted that materials thicker than 1/8" may work, but will require a larger surface area of contact to ensure proper triggering (i.e. two fingers instead of one). Increasing the surface area of the contacting object helps to increase the measurable capacitance at the point of contact that further seperation causes to reduce, balancing these factors out.